ufw provides a framework for managing netfilter, as well as a command-line interface for manipulating the firewall. 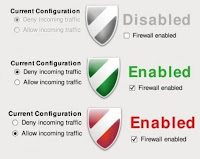 ufw aims to provide an easy to use interface for people unfamiliar with firewall concepts, while at the same time simplifies complicated iptables commands to help an adminstrator who knows what he or she is doing. ufw is an upstream for other distributions and graphical frontends. Gufw is a graphical user interface way to manage your ufw. It supports common tasks such as allowing or blocking pre-configured services, common P2P, or individual IP/port(s), and many others!